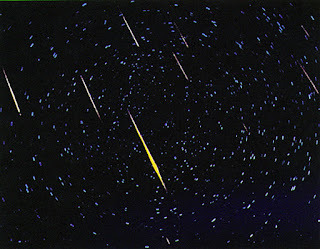 Every year in November, peaking at about the 17th of the month, a meteor shower can be seen, dropping tiny streaks of light. Some flashes are so slight that you think you’ve imagined them. Other meteors are so bright that they make the annual pilgrimage to the back yard lawn chair, in your warm bathrobe and thick socks, worth the 2am alarm clock call. because of the Nov. 14 "supermoon,"
The mid-November Leonid meteor shower is caused by the dust particle trail of the Comet Tempel-Tuttle. Its journey around our solar system takes it close to the sun (perihelion) and the earth crosses that debris path of sand-sized particles, which strike our atmosphere and flare up on entry. Every 33 years, we pass through a zone of particles more dense than the other years, and that’s when we experience a more spectacular starfall. I was educated in a Christian school where we learned in Bible class that the signs of Jesus’ second coming would be war, pestilence and plagues, earthquakes, deadly persecution of those who professed they followed him, offending one another, hate, false prophets, and taking the gospel to the entire world. But that wasn’t yet the end! There would be false prophets and those claiming to be the messiah and savior and who did miracles, and the “elect” or people who loved and served God would have to flee for their lives. Anne Hutchinson and her followers believed themselves to be the Elect, and when they were banished on pain of death, they felt it was confirmed. 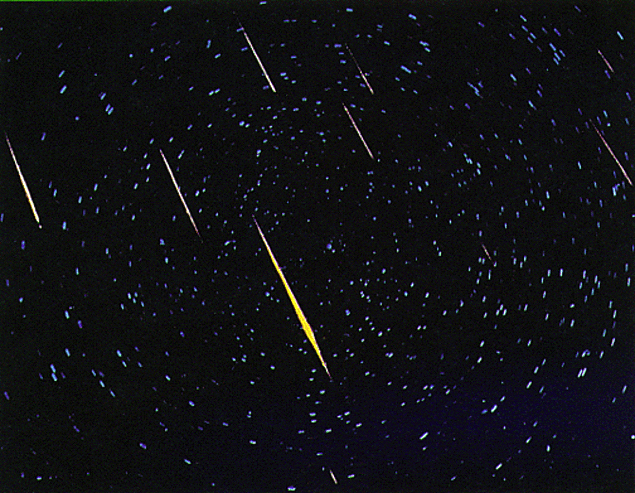 1966 Leonid meteor storm--NASA photo. come from the space between Regulus and the Big Dipper. In the fullness of God's mysterious timing, that’s when the heavens and earth would be jolted. “The sun will be darkened, and the moon will not give its light; the stars will fall from heaven, and the powers of the heavens will be shaken” (Matt. 24:29), said Jesus, who may have been referring to the destruction of Jerusalem in 67-70AD, or of the final events of this world. Theologians disagree, but most say the similar heavenly events, which take place all at once, described in Revelation 6:12-15 point to the end of the world. 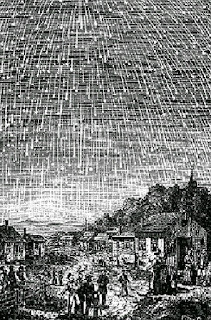 In Bible class, we were taught that the earthquake and tsunami at Lisbon in 1798 was The Big One, and that the sun and moon had darkened in the early 19th century (it was the result of a catastrophic forest fire in eastern Canada), and that the starfall on November 17, 1833, when the stars rained down in a terrifying and bright cascade for hours, fulfilled that prophecy. 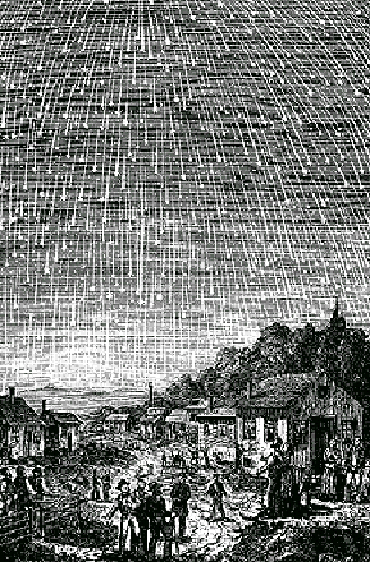 While the LDS and Millerites were in their infancy, the 1833 Leonid meteor shower produced its strongest showing in recorded history. It was one of the years in the 33-year cycle of Tempel-Tuttle comet dust, though the comet wouldn’t be named until 1866 (33 years later). 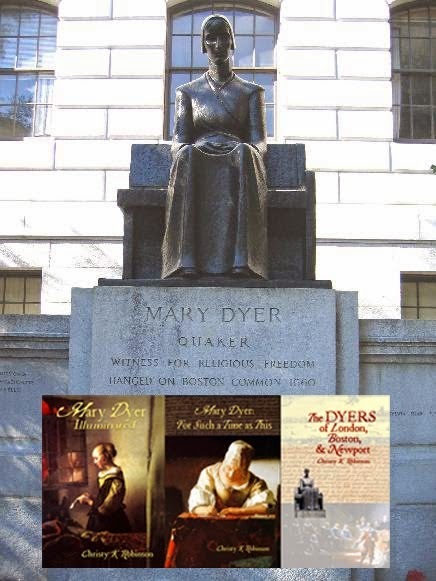 I used that 33-year cycle factoid when writing my first biographical novel, Mary Dyer Illuminated. Counting in 33-year intervals, I saw that 1635 was one of the peak years, and I wrote a scene about it. There was no journal entry for John Winthrop or the other historians regarding a meteor shower, perhaps because that year, the shower was seen better in Asia or Europe, or it might have been cloudy in Massachusetts. 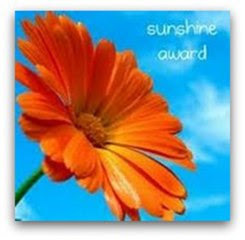 But it made a wonderful scene in which Mary Dyer experienced the Light of God that would shine at her very core in the last years of her life. In the 17th century, every natural event was considered apocalyptic, from the hand of God. 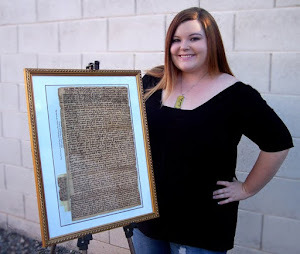 If you review the signs of Matthew 24, our ancestors and founders had endured religious persecution and fled from it. They’d experienced bubonic plague, smallpox, and typhus epidemics. On May 30-June 1, 1630, they’d seen a comet so bright that it, along with the noonday sun, cast a double shadow. There were religious-based wars in Europe. 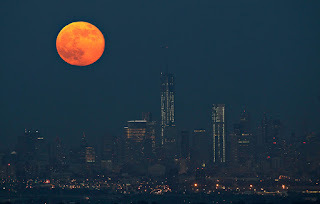 There was a great earthquake in New England on June 1, 1638, and a blood moon (annular eclipse) three weeks later. Anne Hutchinson and Mary Dyer, teaching the Covenant of Grace, were considered false prophets. When the Massachusetts exiles settled in Portsmouth, Rhode Island, they even called the men who believed they’d discovered new biblical truths “prophets,” because it meant that they’d be inspired or received a revelation from God. (Prophet didn’t mean a foreteller of events, but a messenger.) 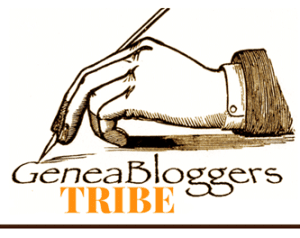 In Great Britain and Europe, new sects, including the Friends/Quakers, emerged and drew thousands of adherents away from established state denominations. 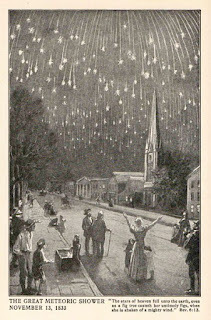 1833 Leonid starfall in New England. “In the year 2034, Earth is forecast to move through several clouds of dusty debris shed by comet Tempel-Tuttle from the years 1699, 1767, 1866 and 1932. If we’re lucky, we might see Leonids fall at the rate of hundreds per hour, perhaps briefly reaching "storm" rates of 1,000 per hour, experts have estimated. 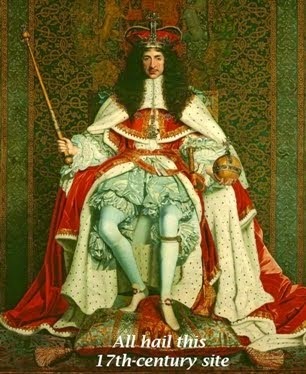 Christy K Robinson is the author of this award-winning blog and books on the notable people of 17th century England and New England. Click the links to find the books.